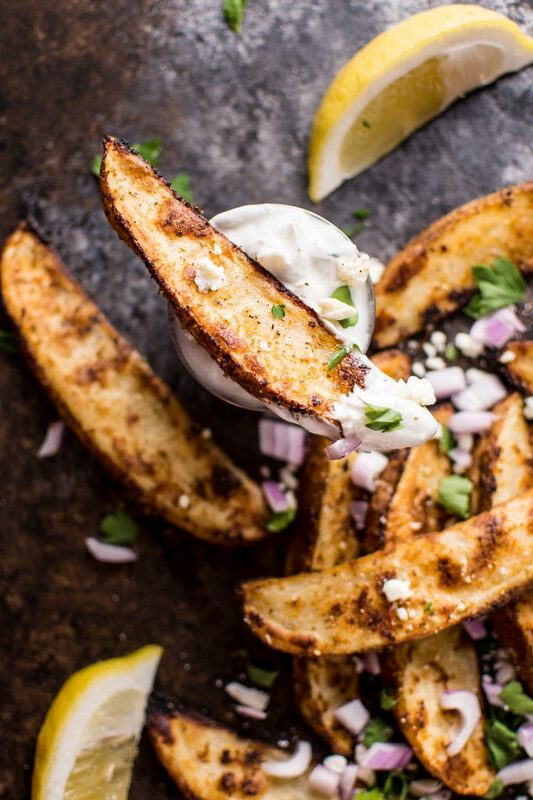 These Greek potato wedges make a tasty appetizer or side dish. Served with flavorful garlicky tzatziki for dipping! 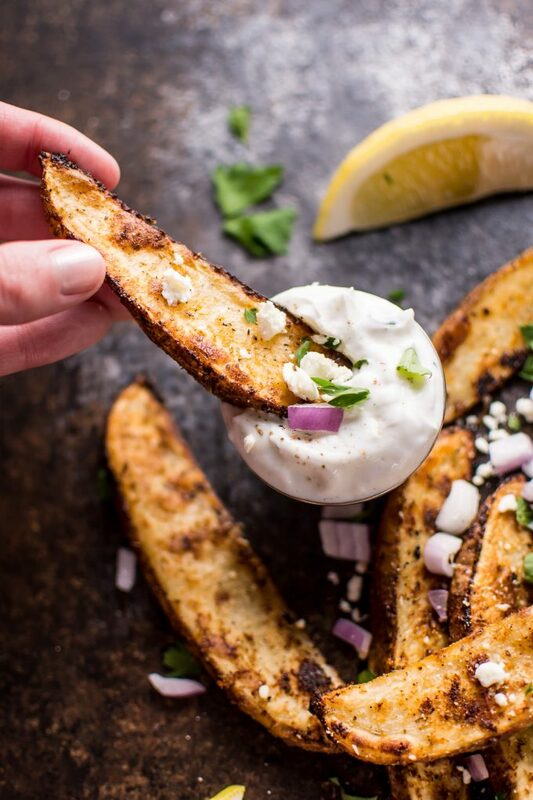 The lemony potato wedges are baked to perfection then topped with red onions, feta cheese, and fresh parsley. The first time I made these Greek fries, I burned them. For some reason, it didn’t occur to me to flip them halfway through. Yikes. Anyway, the second batch turned out much better. Nice and crispy on the outside and soft and fluffy inside. Soaking the potatoes in cold water beforehand helps remove some of the starch so they crisp up better. I seasoned the potato wedges in lemon juice, olive oil, oregano, garlic powder, paprika, onion powder, and salt & pepper. These are inspired by those delicious lemony roasted potatoes you can find at Greek restaurants. Red onions and feta add more of that quintessential Greek flavor. I love these easy Greek potatoes so much that I included them in my Greek meze platter. 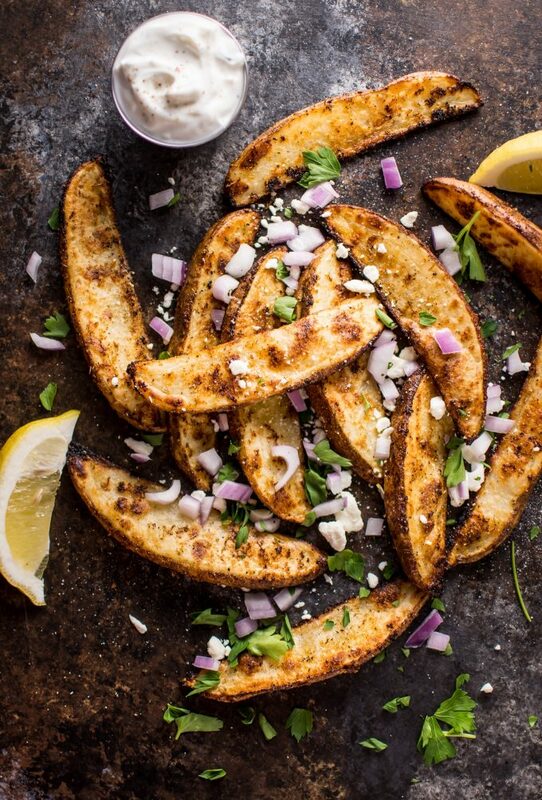 You could definitely just drizzle the tzatziki over the fries. I decided that for photo purposes one screw-up was enough (I was out of potatoes and patience), so I neatly put the tzatziki in a little dipping container. I made the tzatziki, but you could always use store bought to save time/effort. I hope you enjoy these Mediterranean potato wedges! 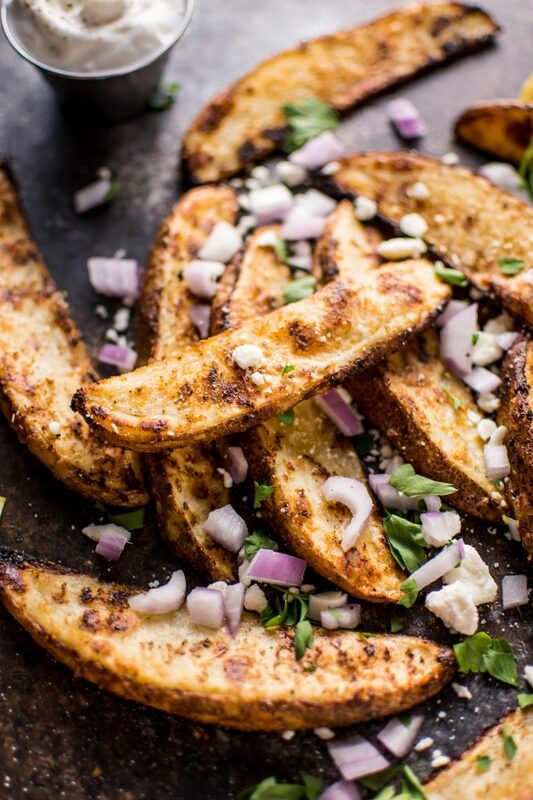 These Greek potato wedges make a tasty appetizer or side dish. Served with tzatziki for dipping! Soak the potato wedges in ice water for 30 minutes. Preheat oven to 425F. Move the rack to the middle position. Add the garlic powder, oregano, paprika, onion powder, salt & pepper, lemon juice, and olive oil to a small bowl. Dry the potato wedges off (I use paper towel) and add them to a large Ziploc. Pour the seasoning mixture over them then toss until they're evenly coated. Arrange them in an even layer on a baking sheet. Bake for 25-30 minutes, flipping halfway through. Meanwhile, prepare the tzatziki. Top them with the tzatziki (or put some in a container for dipping), feta, red onions, and parsley. Squeeze extra lemon on if desired. They look so delicious! Love homemade fries!